Creating a modern bedroom is easier than you think. First, consider starting at the heart of the room and pick just the right modern bed. Finding the right bed can be a task in itself, but Platform Beds offer a modern flare that traditional beds do not. Most beds today do not need box springs, as they seem to be a thing of the past. Today's modern bedrooms have a ton of options, and can be just as functional as they are stylish. Less is more in modern decor, and the biggest thing revolves around quality. Solid wood beds are becoming the social norm once again compared to the 80's and 90's where we were continuously looking for a cheaper alternative. Textures are one of the biggest things to look for in a modern platform bed today. Nightstands, dresser and armoires are becoming just as visually stunning as the beds themselves, packed with options like soft close drawer systems, and velvet lining. Today's hottest designs coupled with new technology has never been a better time to make your bedroom modern. Next the accessories, which will take a normal bedroom and make it extraordinary. Consider various types of lighting from EL Wire to LED Lights, as they can match in nearly any color room. 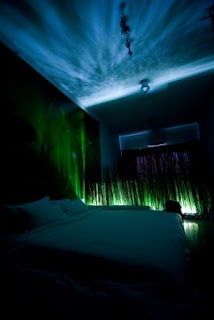 EL Wire can run in a track around the bed, whole room, around just your bedroom accessories, or even across the baseboards to create a spectacular lighting effect. They can create a stunning effect around your room and is one of the least expensive methods of making a normal room extraordinary. EL Wire can be shaped into designs, or even hide it behind crevices to create a halo effect. They can go on electronics like TV's or Computers, or put it on your remote so you will never lose it again. For more information on different lighting products, check out Electroluminescent Wire Kits, a guide to the latest and best lighting for every need. It can be easier than you think to install, with a working knowledge of simple electronics, you can have your bedroom looking like a room of the future in no time.